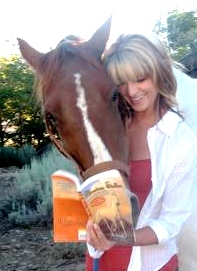 This book tells of the plight of wild horses in America. 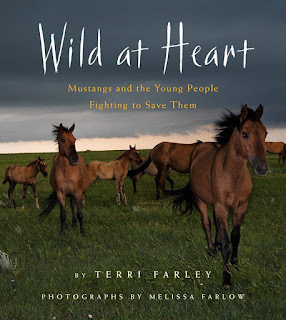 Beginning with the history of prehistoric horses to the efforts to protect wild horses from being driven off public lands in the 1970s, Farley provides a look into the world of wild horses and their treatment. Farley explains how the government has passed laws to protect these horses and then systematically has broken its own laws or has twisted them to suit the needs of others. 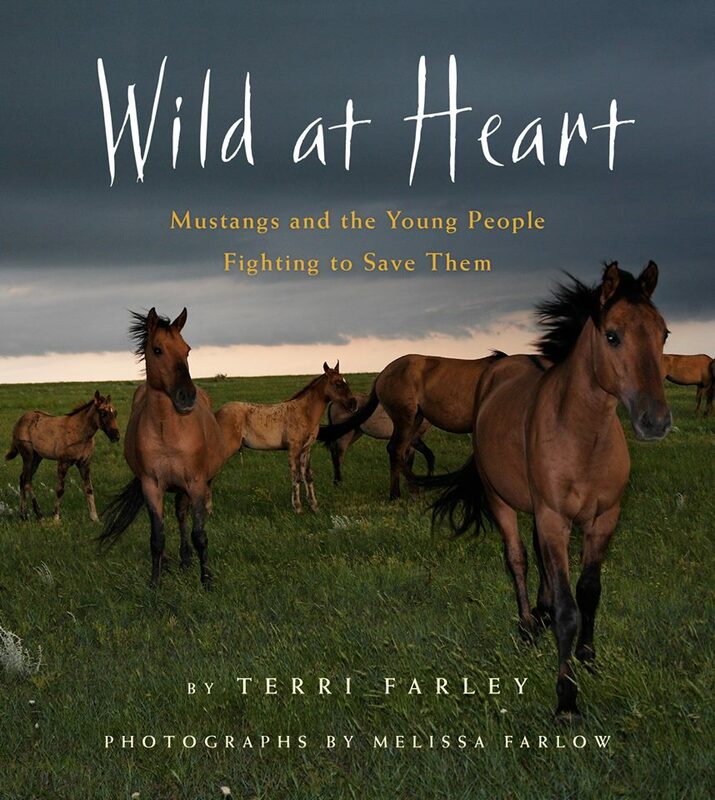 She then details the efforts of young people who are fighting to protect the wild horses. Ranging in age from nine to 18, they demonstrate the leadership, passion, and determination it takes to fight for a cause. This book is a good example of creative nonfiction that blends historical and persuasive writing. School Library Connection suite at www.librariesunlimited.com. In just 3 days I'll be in Houston, Texas at the Texas Library Association conference! It's the biggest library conference in the U.S. and the only place my presentation received a standing ovation. To be fair, I was talking about the real Phantom Stallion, so what did I expect? This time I'll share the stage with my WILD AT HEART editor Julia Richardson (she read my first Phantom Stallion book & said -- "Hey, this could be a series.") and photojournalist Melissa Farlow. Fiction and non-fiction can inspire youth to take on a cause. Provide the launch pad that vaults young people over barriers to fight for issues. Hear an example of advocating for a cause and receive hands-on experience with tools and resources to help lead teens toward action. Terri Farley and Julia Richardson, Houghton Mifflin Harcourt Books for Young Readers; and Melissa Farlow, Melissa Farlow Photography. Research for Wild at Heart took me into the issue of wild horse birth control. It's a rarely needed "solution" to a man-made problem that had to be explored. Instead of accepting remote darting (like you've seen on wildlife TV specials), BLM and Oregon State University want to experiment with spaying, shown in this video. 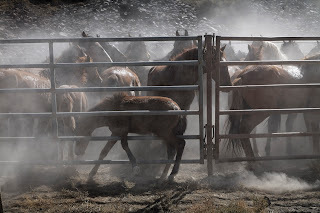 In 2012, US District Judge Beryl Howell, ruling on BLM wild horse policy declared that BLM “may not simply remain studiously ignorant of material scientific evidence well known to the agency and brought directly to its attention in timely-filed comments”. Sadly, she was wrong. Here is my letter to BLM, Oregon State University and Wild Horse Advisory Board members. 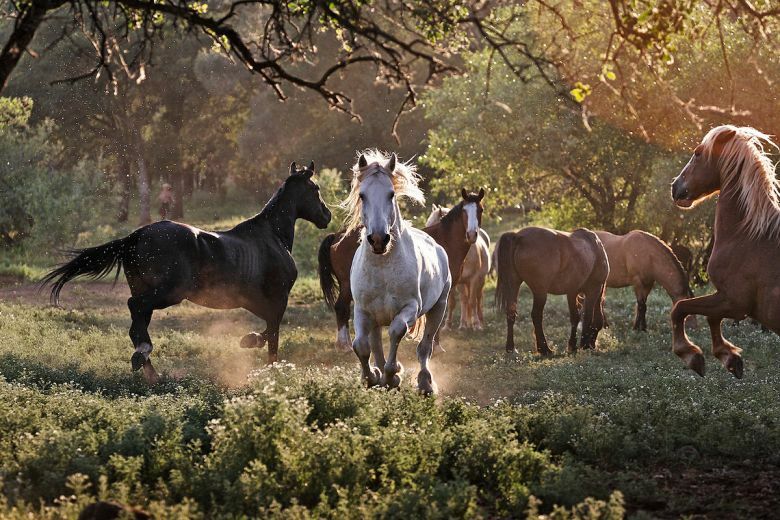 In a 2013 report, NAS recommended birth control darting for wild horse herds which demonstrated a need for management. The Humane Society of the United States concurred. Despite consensus from all credible agencies that it’s cheaper and more humane to manage wild horses on the range, BLM remains stubbornly opposed to modern management techniques. Instead, the Bureau offered $10 million to anyone who found a new means of birth control, as they paid independent contractors to chase, trap and corral the West’s remaining wild horses. Now, Oregon State University and BLM are fired-up to experiment on mustangs with spaying surgery. “Let’s see what happens” is a bad strategy when test subjects are alive and answers are at hand. At least 10% of spayed mares died at the Sheldon Refuge. Many others were released and not tracked. Another example? BLM facilities have a high mortality rate in gelded stallions (a procedure considered safe and routine for domestic horses). But these are wild animals. They are not unconscious and are traumatized. If they don’t go into shock and die, they often succumb to a lack of post-op care. This crosses the line from experimentation to molestation. Can you really believe sterilization will be different for wild mares? Can you ethically substitute hope for experience? Summer is a carefree time for kids, but not necessarily for educators, parents and caregivers. They have to be wary of a very well documented phenomenon-the summer slide in reading achievement. Enter the summer reading list. Today, over 95% of libraries have summer reading programs to help prevent the summer reading slide. Research has shown that kids who enroll in library-run summer reading programs return to school not having lost any reading skills, and as more interested and engaged readers. Taking a cue from librarians, SCBWI is developing its first ever Summer Reading List. 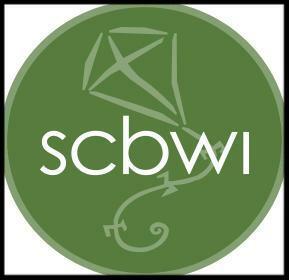 In order to be included, you need only be an SCBWI member and submit one PAL-published book. Our list will be organized into fifteen regions (the same regions as used for the Crystal Kites), and organized by grade level - K-2, 3-5, 6-8, 9-12 and genre. Not only will the SCBWI Summer Reading List offer lots of choice, but the kids will be able to select books by local authors-all books will denote the author and/or illustrator's place of residence. The first SCBWI Summer Reading List will be available mid-May, both in hard copy and in downloadable form.